Genesis unfolds in the aftermath of nuclear war. A group of survivors have taken shelter in an underground bunker. In the years since the bombs, they have developed a nearly fully functional society complete with government oversight, a police presence and perhaps most importantly, a research unit tasked with creating a machine which could access untapped food stores but instead, the scientist in charge of the project has created an AI housed in a humanoid shell. When the food stores begin to deplete and it appears that the general population is ready to revolt, things get even worse when the robot gets free (or is let loose - the details are unclear) and takes matters into its own hands. 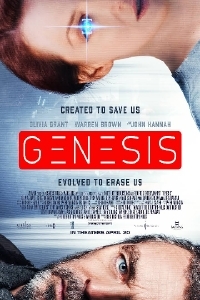 Genesis is being toted as the first in a three movie sci-fi saga which, from the suggestion of the trailer, will track not only how a group of humans as they fight to survive but how an AI will likely be the downfall of whatever is left of humanity. I'm all up for apocalyptic survival stories and I love a good AI cautionary tale so this is clearly in my wheelhouse and it seems writer-directors Freddie Hutton-Mills and Bart Ruspoli have made the most of their limited budget. This is the third feature from the duo. Genesis will be available in theatres and VOD on April 20.